Clearwater Commons is an intergenerational residential community, with participants ranging from small children to elders. We began forming in June 2006 when a group of families purchased a 7.4-acre site on North Creek, 11 miles north of the Seattle, Washington, city limits. 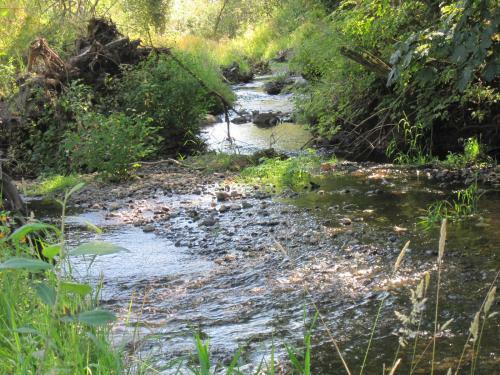 The site includes wetlands, wooded spaces, and a salmon stream. As of November 2018 there are nine completed and occupied homes, three homes under construction, a common shop, shed, garden and a 300sf passive guest house. When complete the community will have 16 residences (a mix of two and three-bedroom town homes and single family residences) plus a common house. Nine families currently reside here; one family are building, two homes are for sale and under construction and four sites are available for sale. The physical design of the community represents our underlying values of community and low-impact development. Pedestrian walkways, community gardens, benches, shared shop, tool and storage sheds, and play spaces reflect our desire to interact with neighbors through the natural course of our days. The inspiration for this community grew from founding members’ involvement in The Clearwater School, located across the street. Our shared experience with the school encourages us to allow the structures for community meetings, gatherings, and events to evolve through our daily interactions, rather than follow a preset or mandated framework. We take on a responsibility to act as stewards of our land—-restoring and enhancing the natural environment, including the stream, wetlands, habitat, and wildlife. We value relationships between individuals, families, and our environment, and promote a lifestyle that will sustain these relationships. We trust each family to make decisions that are aligned with our intent of sustainability and that balance individual autonomy and community needs. We expect that the specific commitments of our community will change over time, and we wish to avoid hard and fast rules. We value communication and discussion and take the time needed to voice, discuss, and understand diverse perspectives in order to reach informed and conscious decisions.